Power Saving Technology to maximise the brightness in the summer and double the runtime on shorter days. USB charging point for additional power charging when needed. Installs in seconds - no need to dig up your garden to lay expensive mains cable. 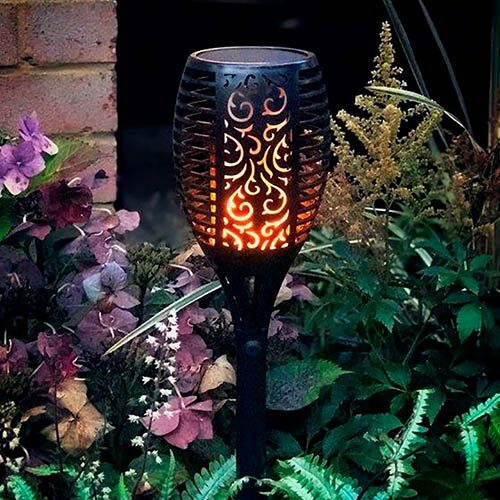 A beautifully designed solar torch light that produces a striking lighting effect which looks and moves exactly like a real flame. Perfect for marking borders, flower beds and paths, the TrueFlame™ Solar Torch Light is wireless, completely solar powered and fully automatic - they're absolutely outstanding when used in a group of 3 or more, especially when lining a path. Designed to work all year round, the Solar Torch turns on automatically at night and turns off automatically at dawn and has an optional Power saving mode for superb winter performance - reducing brightness in favour of longer run times. Simple quick and safe to install with everything you need in the box, the garden torch is Waterproof and designed for outdoor garden use - there's no need to dig up your garden to lay trunking and cables. The torch also includes a USB charge point so that if the battery does run down, the torch can be recharged without the need for sunlight. Power Saving Technology - maximise the brightness in the summer and double the runtime on shorter days. Note the torch will only illuninate in darkness.